There's a lack of Qtractor video tutorials..
Post fully complete "how to" guides and tutorials here. This is a great place to get feedback on stuff you might put in the wiki. Re: There's a lack of Qtractor video tutorials..
Death wrote: @thebutant - Yeh to be honest, one of the things that attracts me to it is the fact that the GUI doesn't have that bare minimum Windows 95 look that a lot of these Linux DAW's have lol.. I know the look of a program doesn't mean it doesn't function well, but man, it definitely makes it hard for me to use something I'll be spending so much time with if it looks like crap. I'm the same with plugins - I don't like a utilitarian interface, I like on that looks like a piece of analogue gear It just inspires me more and that's totally what matters when making music, right? Agreed. We're not allowed to say that we hate the all new and improved Windows 10 look that looks like Windows 3.11. Like you I am not going to spend hours looking at something that looks unpolished. That's it and that's all you need! Name one DAW with the possibilities of Qtractor that looks as simple as that. Notice that Qjackctl has an extra tab called "Alsa". This actually is the tab for "real" Midi. Confusingly, Jack has its own version of Midi that it calls "Midi". 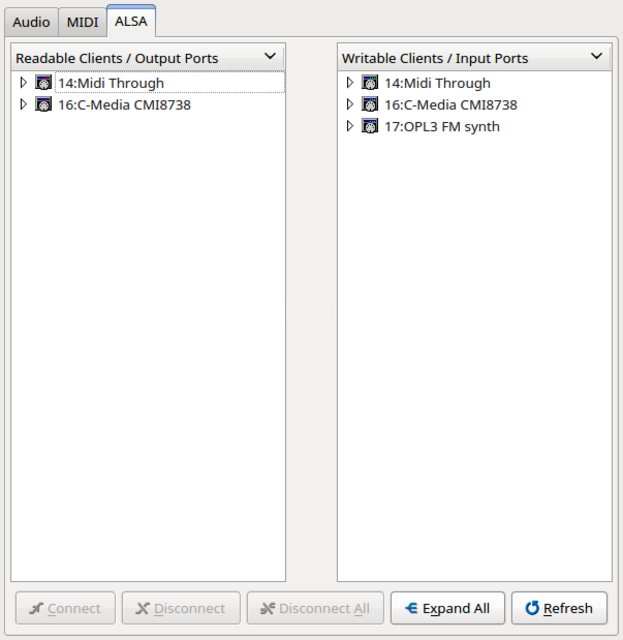 So Jack calls regular Midi "Alsa" because it is from Alsa (Alsa = sound driver for all of Linux). Qtractor omits the Jack version of Midi. I like that. Last edited by Linuxmusician01 on Thu Feb 14, 2019 12:53 pm, edited 1 time in total. If I used Qjackctl it wouldn't look like that. You simply need a dark theme for Qt. You make music with your ears, not your eyes. I know what you mean about the look, but surely you should choose music software based on what it sounds like, not what it looks like. merlyn wrote: If I used Qjackctl it wouldn't look like that. You simply need a dark theme for Qt. You make music with your ears, not your eyes. I know what you mean about the look, but surely you should choose music software based on what it sounds like, not what it looks like. You're absolutely right. But it's not only about the colors and the "bling bling" of the looks. 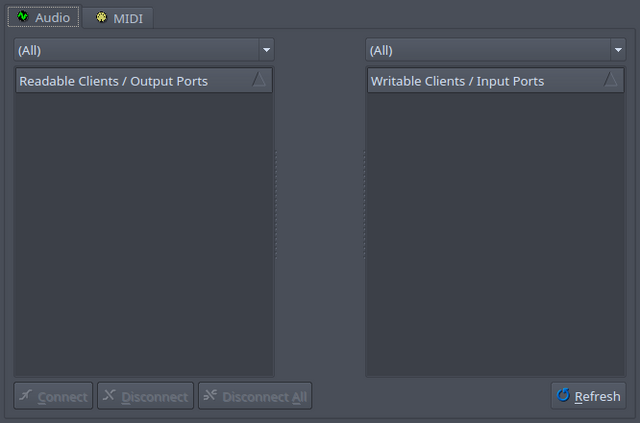 I think Qtractor is very clear in its layout (the omission of "Jack midi" for instance) and most other DAW's are not. And clarity in layout makes better and faster work flow, I think. I've just realised that windows I set to stay on top don't get saved like that with the project. This means I have to keep doing it with every plugin, everytime I load my project Is it possible to make these changes permanent? Yep. A functional and nice looking GUI makes all the difference! Obviously the sound is what matters most, but the GUI matters too. I make music with my ears and my eyes. Not sure about you, but I actually look at the DAW while I'm using it.. I did already explain why it matters though. Btw, DAW's shouldn't sound different from eachother. That's not their purpose, unless it's Harrison Mixbus.. Thanks for that blog link, btw. I'll check it out after I've read through the Qtractor manual! But I have noticed some issues with the program that I would like to share with the developer who I believe is 'rncbc' on here, right? 1. Ability to see the amount of delay caused by plugins on an individual basis and also the over all amount of delay caused so that proper adjustments can be made by the user rather than guess work. 2. Automatic plugin delay compensation which constantly adjusts to the changing amount of delay caused by plugins would also be a very nice addition to the above. 3. Ability to set independant bit depths for recording and exporting. I would suggest having the main audio menu option for bit depth to only apply to a recording & mixing scenario, then when you export a song to audio, have the option in that export menu to change the desired bit depth for the exported track. And on that note, are there any dithering functionalities available? If not, that'd be nice to have. 4. Ability to have windows with 'Always on top' enabled to remain in this state after said window has been closed and even after the session is reloaded so that it only has to be set the once. 5. Need window size & zoom settings to stay as set by the user, either globally or simply within saved sessions/templates. 6. Ability to categorise plugins in a convenient menu (EQ's, Compressors, Reverbs etc.) rather than just having one massive list with all plugins. 7. Ctrl + scroll on the playlist does horizontal zoom, where as on the piano roll it does over all zoom. I think it would make more sense to have the piano roll also do horizontal zoom by default. 8. Being able to zoom vertical/horizontal by dragging the edge of the scroll bars/navigation windows would be quicker & more convenient than having to click the magnifying glass buttons. 9. Being able to select all notes on a row just by doing a modified click on the related piano note. 10. Being able to select a group of notes and adjust all of their velocities by an equal amount at once by holding down a key (maybe Alt, Ctrl or Shift) and scrolling the mouse wheel. 11. You can place the playhead by shift or ctrl clicking with the left or middle mouse button. It would also be nice to be able to continue dragging & relocating the playhead in this fashion just by holding down the first click rather than having to keep clicking new locations or dragging the top point of the playhead itself. 12. It's nice to already have keyboard shortcuts configured for a new user to get a sense of the program's logic and workflow & minimise the initial configuration needed (while keeping the ability to customise them if desired). I would suggest figuring out a control scheme and having it pre-setup for new users in future. This would also be good when users teach eachother how to use the program as most users will probably just stick with the default configuration. Last edited by Death on Sun Feb 17, 2019 11:51 pm, edited 1 time in total. Death wrote: But I have noticed some issues with the program that I would like to share with the developer who I believe is 'rncbc' on here, right? first of all you should know about my usual, decade old stance: qtractor is not a DAW but a sequencer with some DAW features. Death wrote: 1. Ability to see the amount of delay caused by plugins on an individual basis and also the over all amount of delay caused so that proper adjustments can be made by the user rather than guess work. 2. Automatic plugin delay compensation would also be a very nice addition to the above. qtractor does not have support for automatic plugin latency compensation and there are no immediate plans to support that anytime soon. sorry. Death wrote: 3. Ability to set independant bit depths for recording and exporting. I would suggest having the main audio menu option for bit depth to only apply to a recording & mixing scenario, then when you export a song to audio, have the option in that export menu to change the desired bit depth for the exported track. And on that note, are there any dithering functionalities available? If not, that'd be nice to have. however this is provided through the audio file framework in charge (libsndfile) and specification eg. WAV 16bit (default), 24bit, 32bit float (recommended); dithering is only applicable when converting from a higher bitdepth to a smaller one so that's why it is one of the top recommendations to you always use a 32-bit float audio pcm format which matches with JACK and thus dithering should be only an option at the sound-device interface (D/A). Death wrote: 4. Ability to have windows with 'Always on top' enabled to remain in this state after said window has been closed and even after the session is reloaded so it only has to be set the once. Death wrote: 5. Need window size & zoom settings to stay as set, either globally or simply within saved sessions/templates. they are set globally and some plugin window positions are saved to sessions -- what exactly are you not seeing? Death wrote: 6. Ability to categorise plugins in a convenient menu (EQ's, Compressors, Reverbs etc.) rather than just having one massive list with all plugins. you can search text in whatever by name, label or path, but categorization is something that is not always provided by all plugins and managing that yourself is rather tedious and a waste of time IMO. however I'd welcome any brave soul's contribution in the form of code, patch, pull-request, etc. if anyone is willing to. Death wrote: 7. Ctrl + scroll on the playlist does horizontal zoom, where as on the piano roll it does over all zoom. I think it would make more sense to have the piano roll also do horizontal zoom by default. check menu View > Zoom > Horizontal, Vertical, All (All=both). you can select all notes on a row, even on multiple rows: just do a "lasso" (click+drag+release) over one left-keyboard note or piano key. also, in the midi clip editor (aka. piano-roll) in particular, if you select more than one event in a group, changing the value (eg. velocity) of one, by dragging the top edge of the vertical bar, the change is applied to the whole selection, not only the one being dragged up and down. Death wrote: 11. You can place the playhead by shift or ctrl clicking with the left or middle mouse button. It would also be nice to be able to continue dragging & relocating the playhead in this fashion just by holding down the first click rather than having to keep clicking new locations or dragging the top point of the playhead itself. you have what you have now and that is not going to change any time soon; currently you only have the option to View > Options... > Display > Reverse middle-button modifier role (Shift/Ctrl); maybe you can try whether that is better to you. Death wrote: 12. It's nice to already have keyboard shortcuts configured for a new user to get a sense of the program's logic and workflow & minimise the initial configuration needed (while keeping the ability to customise them if desired). I would suggest figuring out a control scheme and having it pre-setup for new users in future. This would also be good when users teach eachother how to use the program as most users will probably just stick with the default configuration. what exactly do you have in mind? there are keyboard-shortcuts already configured as "factory" default that follows the pretty old UI standard for generic SDI applications and plus some specific to qtractor; you're free to override these and add some more of your liking; you can even map to MIDI controllers; choices are almost endless as are different and personal workflows. finally, please consider to move over to https://www.rncbc.org and/or raise tickets or issues on sf.net or github.com resp. as this here is not quite one a proper support forum for talking deep on qtractor in particular or yours truly qstuff in general. ps. sorry for the "nope"s above; please don't take'm ad hominem. first of all you should know about my stance: qtractor is not a DAW but a sequencer with some DAW features. I remember reading this somewhere before and I understand what you're saying, but to be fair, Qtractor is a DAW as far as I can see It's really not missing much that I would normally use in other DAW's. That's a shame. That was one of the main issues I was hoping there'd be plans for. Maybe sometime in future? however this will be only provided through the audio file format specification eg. WAV 16bit (default), 24bit, 32bit float (recommended); dithering is only applicable when converting from a higher bitdepth to a smaller one so that's why it is one of the top recommendations to you always use a 32-bit float audio pcm format which matches with JACK and thus dithering should be only an option at the sound-device interface (D/A). It's mostly only needed when converting to a lower bit depth, yes. It's just that you normally want to export projects at 16 bit (dithered) for normal listening and uploading to streaming services etc. There's no point in higher bit depths for those purposes as far as I know. as discussed earlier, this is a general WM issue; you should consider bluebell's advice for that matter. bluebell wrote: Although Rui might reveal features I didn't know Qtractor has them you can do a lot of windowing stuff with devilspie/gdevilspie. For example I have a devilspie receipt that places the mixer always on virtual desk 2 and maximises it. So with the piano roll, for example, when I resize the window it only stays that size for the specific midi clip and project I've set it for. There seems to be a unique piano roll instance for each midi clip with its own window settings. I was hoping I could just have one window whose settings remain the same across all midi clips and projects. Is that possible? I always categorise my plugins. I often categorise them at least by the developer but sometimes for their purpose too. I find it way quicker to find what I want like that rather than one massive list. That small amount of work to initially categorise them saves lots of time later when searching for plugins. Unfortunately I have no idea how to code, otherwise I would contribute in this way..
Ah yeh. I get you can change it. It was just a suggestion as a default setup for new users for the sake of consistency seeing as the playlist does it that way, No big deal though! I didn't realise that about the user manual either. It definitely gave me a good start in the program though! I don't actually see that option :/ My version is 0.9.4 so I think it's up to date. Anyway, again, no big deal! Was just another little QOL suggestion. Well I don't really know yet seeing as I'm new to the program so I've got to figure out what makes sense with it. But seeing as there's a lot to be configured, I'll probably just set it up to feel like FL Studio because that's the program I've spent the most time with. However, that's specific to me and I'm not suggesting that's what should be done by default. If there were already a full control scheme in place, I'd just learn that as it is instead. That's what I normally do. And when I've changed things in the past, I've sometimes realised why the default control scheme was better and end up switching back to it. And like I said, it's really good to have this consistency with the program so that when users make tutorials for other users, they're all on the same page with the keyboard shortcuts, especially new users who haven't configured anything yet, and those who have configured things differently will already know that their shortcuts are different to the defaults used in tutorials. But whatever you think works best with this program, and if you decide to keep it as is, that's cool, I respect that! And yes, I will do that for future requests of this nature! Thanks for the replies and for making Qtractor! This thread is awesome. Thanks to everyone involved in the discussion. Am I missing something in terms of how to split clips efficiently? Right now, all I know how to do is move the play ahead to the location of my desired split and then either right click and select clip/split or use the same entry from the top menus. This work flow would be fine but it's tedious when I'm playing something in a loop since I have to stop playback in order to perform this operation. Also, there doesn't seem to be a shortcut key that can be used to perform the split itself. While I'm at it, it also doesn't seem to be possible to split lots of clips at once. If I have multiple tracks selected, shouldn't I be able to (using the same workflow described above) position my play ahead and use clip/split in order to split all highlighted clips at that location? Going further, what if I have a range selected? Wouldn't the split operate against the beginning and end of each highlighted clip within the targeted range? windowsrefund wrote: Am I missing something in terms of how to split clips efficiently? Right now, all I know how to do is move the play ahead to the location of my desired split and then either right click and select clip/split or use the same entry from the top menus. This work flow would be fine but it's tedious when I'm playing something in a loop since I have to stop playback in order to perform this operation. Also, there doesn't seem to be a shortcut key that can be used to perform the split itself. While I'm at it, it also doesn't seem to be possible to split lots of clips at once. If I have multiple tracks selected, shouldn't I be able to (using the same workflow described above) position my play ahead and use clip/split in order to split all highlighted clips at that location? Going further, what if I have a range selected? Wouldn't the split operate against the beginning and end of each highlighted clip within the targeted range? yes. noted. this also aliases to the also old request to show other clips (same track or else) as in possibly a dimmed background or layer.